I've been trying to eat the most repulsive-seeming things I can find at Famima!! to see what exactly is awful there. For the most part I've been disappointed in that almost everything has been delicious. The Fried Curry Bread seems to be the worst so far, but it looks so good, that I almost give it a pass. 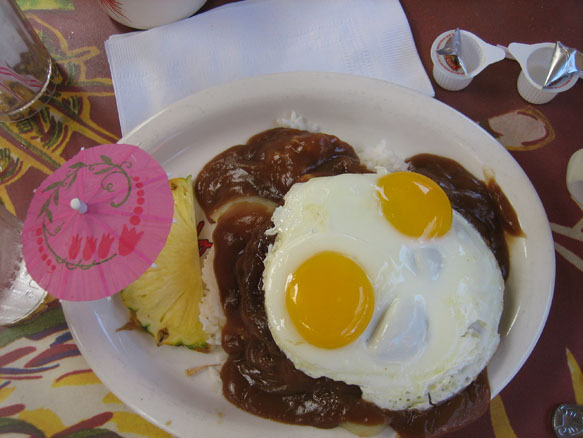 Today I tried something called the Loco Moco, which purports to be a pork/beef patty smothered in gravy, nestled in rice, aside its good pal half-a-boiled-egg, and staying as far away as the box allows from its weird side-salad, which seemed to be made of up cabbage, beefs, and chickenses. The Famima!! version of Loco Moco was quite good, but the side salad was the best part, further confirming my theory that it's the wrost looking things at Famima!! that are the best. Multiple-Meats seems to be the phrase to live by at Famima!! and I can't really fault them.